As the schedule starts to shorten, so does the bubble. 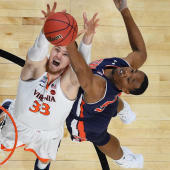 A few teams were able to play themselves safely into the field for the 2019 NCAA Tournament on Saturday, while one team's bubble completely burst. UCF and Utah State also picked up signature wins that improved their chances dramatically, but because of the schedules they have left, there is still more work to do. On the other hand, Clemson and NC State came up short of getting the big wins they need. at Oregon State: If you know which Arizona State team is going to show up today, let coach Bobby Hurley know. The Sun Devils are capable of both great and miserable things, sometimes in the same week. They are coming off a blowout loss at Oregon and now need to beat the Beavers to keep their fading hopes alive. vs. Tulane: Simply put, Temple must win this game. Tulane has not won a conference game, and this would be a disastrous loss for the Owls as they try to make their NCAA Tournament case. UCF -- beat Houston 69-64: The Knights picked up a huge win for their tournament resume, ending Houston's 33-game home winning streak. If not for the difficulty of their remaining schedule, they would be off the bubble. Suffice to say, one more win should do it. Utah State -- beat Nevada 81-76: The Aggies knocked off Nevada to pick up their second Quadrant 1 win of the season and take over first place in the Mountain West. If Utah State can avoid taking a bad loss, it should end up in the field. They finish the regular season at Colorado State. Texas -- beat Iowa State 86-69: The Longhorns were dominant against an Iowa State team that is reeling a little bit. Texas is up to 16-13 on the season and has crawled back onto the bottom of the bracket. It has some pretty good wins this season but has to keep that overall record up. The 'Horns are at Texas Tech next. NC State -- lost to Florida State 73-78: NC State missed another chance to pick up a quality win away from home. The Wolfpack's next opportunity to do that will not come until the ACC Tournament. They have the classic resume for being excluded, and if you think a soft bubble will save them, I refer you to 2016. The bubble was so bad that year that the committee took five teams with something so negative on their resume that in any other year, they wouldn't have gotten a bid. Yet, they still left out South Carolina because of a bad nonconference schedule. And by bad, I mean much better than that of NC State. Alabama -- lost to LSU 69-74: Alabama hung around and had a chance to get the big win it needed, but it came up short. The Crimson Tide has winnable games left, just not easy ones. They host Auburn and travel to Arkansas. Clemson -- lost to North Carolina 79-81: The Tigers came up short again in pursuit of a win that can help them build up their resume. They go to Notre Dame next, which is clearly a must win, then host Syracuse. A win over the Orange would help, but not as much as this one would have, obviously. TCU -- lost to Texas Tech 66-81: The Horned Frogs are falling apart at a bad time. Texas Tech is the league leader, so this isn't a bad loss in terms of quality, but TCU was not terribly competitive. The Frogs have now lost five out of six with the other co-leader, Kansas State, visiting next. St. Mary's -- lost to Gonzaga 55-69: St. Mary's still shows up among the first four out, but I do not see a path for the Gaels to make the tournament as an at-large now. They needed to beat Gonzaga to boost their resume up to that level and now if they do that, they will be league champions. Ohio State -- lost to Purdue 51-86: Playing Purdue at Mackey Arena this season was a problem for everyone, but playing the Boilers without their leading scorer was a disaster for the Buckeyes. It is pretty clear that they need Kaleb Wesson back in the lineup if they have any chance of success. Ohio State travels to last place Northwestern next, and it is not known if Wesson will play. Seton Hall -- lost to Georgetown 71-77 (2OT): Georgetown was able to grind out a win over the Pirates to split the season series. Because of a weak nonconference schedule, the Hoyas are still behind Seton Hall in the chase for a spot in the bracket, but both teams are right around that cut line. Syracuse -- beat Wake Forest 79-54: The Orange took care of business against Wake Forest and have come off the bubble for now. Syracuse needed to avoid a bad loss and they may not have another opportunity for one, depending on the draw in the ACC Tournament. Auburn -- beat Mississippi State 80-75: Auburn picked up its best win of the season and is off the bubble. The schedule the Tigers have left should not hurt them enough to knock them out even if they lose them all. Florida -- lost to Georgia 55-61: Florida has put its tournament hopes in jeopardy with a loss to the Bulldogs, which is the Gators' worst defeat of the season. Now, at 17-12 with games left against LSU and Kentucky, Florida may struggle just to put together a good enough record to be selected. Oklahoma -- beat West Virginia 92-80: Oklahoma has now won three out of four after defeating the Mountaineers. The Sooners still have to face both Kansas schools, so they are not out of the woods yet, but things are looking much better than they did two weeks ago. VCU -- beat Richmond 69-66: The Rams are off the bubble for now after taking down their city rivals. A bad loss could put them right back on it though and they have two potential bad losses left before the conference tournament. Wofford -- beat Samford 85-64: The Terriers are also off the bubble after completing an undefeated run through the Southern. Barring an unlikely, major upset in the first round, Wofford should end up somewhere in the middle of the bracket. Belmont -- beat SE Missouri State 84-66: Belmont is in the bracket as the Ohio Valley leader, but has a chance for an at-large bid if it needs one. The Bruins would have to lose to Murray State in the conference tournament final for that to be a possibility. Furman -- beat Chattanooga 71-50: Furman is the third seed in the Southern tournament after taking down the Mocs. That is good for the Paladins at-large hopes because it means not facing Wofford until the conference final. Of course, they have to get there first.